Q: What's the simplest way for an older lifter to improve their nutrition? To be clear, I'm not a Ph.D. nutritionist or a registered dietician. But I am a lifter who knows and listens to a lot of smart nutritional minds and has seen great results come from doing so. So take what I say—and what everyone says—with healthy skepticism, but don't let your skepticism keep you from learning. The first thing that springs to mind is making sure you're getting enough protein. Here's why: As we age, we gradually acquire "anabolic resistance," which means that nutritionally, we get less muscle-building "bang for the buck" for every gram of protein we consume. And this isn't "bro science." Layne Norton, Ph.D., and creator of the PH3 Power Hypertrophy Program, lays out a strong case for it in the article "How to Eat for Max Muscle Growth at Any Age." But it's also something that older lifters can usually speak to by experience. The remedy, of course, is more protein. 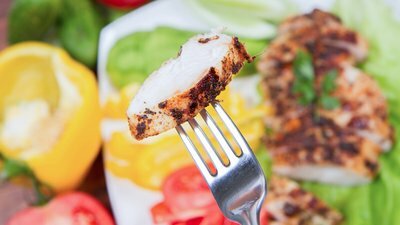 There are other upsides—and no real downsides—to increased protein intake as well, as Jose Antonio, Ph.D., explained on the Bodybuidling.com Podcast. If you're over 40, I'd suggest aiming for 1.25 grams of protein per pound of body weight per day, a number that's consistent with what Norton recommends for the same age range. And yes, eating that much protein can be a chore. But a few key habits can make the medicine go down a bit easier, without you having to become a diehard label reader. 30 in 30: I picked up this simple tip from best-selling author Tim Ferriss: Consume 30 grams of whey protein within 30 minutes of waking each morning. This accomplishes two things: First, you haven't consumed any protein in the past 8 or so hours, so you'll be getting essential amino acids back into your depleted bloodstream. Second, you'll be getting an early jump on hitting your daily protein target. Personally, I aim for "50 in 30" each morning, by consuming two scoops of Optimum Nutrition Gold Standard Whey protein in a shaker bottle. By doing this, I ensure that by 7 a.m., I've already hit 25 percent of my daily protein target. 10 in 100: As a rule of thumb, look for foods and meals that contain at least 10 grams of protein for every 100 calories. So if your favorite "high protein" yogurt only has 8 grams of protein in a 120 calorie serving, it's not really high protein in my book. Look for a better choice. Mix up your sources: It's human nature to settle into habits. Nutritionally, this often means always eating the same things over and over. But when you're shooting for 1.25 grams of protein per pound each day, variety makes the task much more palatable, pun intended. If you've been eating the same 3-4 protein sources since forever, think about high-protein foods you haven't eaten in a long time—salmon or cottage cheese, for example. Know your snacking tendencies: Many folks find that their discipline deteriorates over the course of the day and they're more prone to dietary indiscretions toward nighttime. I'm in this camp myself, and knowing this, I always seek to frontload my protein early on in the day while my discipline is still strong, and budget more carbs and fat (the fun stuff) for nighttime when I tend to have the munchies. Don't go overboard with fat: I know fat is cool right now. And yes, I also know that fat—even saturated fat—is crucial for good health. That doesn't mean you need to be consuming 200 grams a day, however. The reason? While fat is indeed essential, overconsuming it makes it hard to hit optimal protein intake without wildly exceeding your optimal calorie intake. Also, metabolically, fat is the easiest macronutrient for the body to store as body fat. Protein is the most difficult. In terms of fat intake, 0.35-0.40 grams per pound of body weight per day is totally sufficient, and women do just fine on less. You can get strict about it, but if you hit your daily protein target, you may also find that your fat intake will naturally—and necessarily—drop to make it happen. "Eat more protein" and "watch your fat intake" are pretty simple commandments. You can do both without obsessing over calories or memorizing every line on a food label. Yes, a little protein-specific label reading could be necessary at first, but once you know the portions of your favorite foods and what 30 grams of protein looks like in different staples, you'll be set up to fuel your body through solid training like my Total Body Strong program. Yes, this extra nutritional awareness is extra work, but sometimes we need to do everything a little better/smarter/stricter than our younger peers. That's the price we pay for the privilege of living a long life and feeling good doing it!